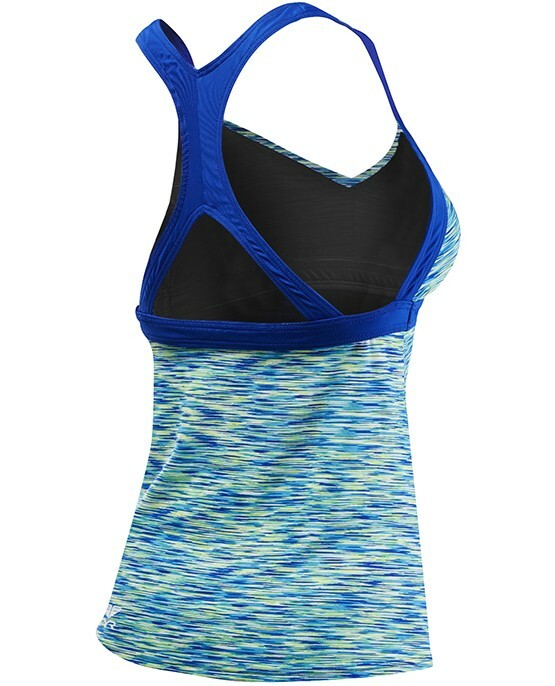 Designed for a dynamic lifestyle, the TYR Women's Ambu Tank - Sonoma caters to adventurists both in and out of the water. From the paddleboard to the yoga mat, the Ambu Tank - Sonoma features an ideal blend of comfort and function. With a modest silhouette that includes a V-neck cut, racerback with support straps and removable contour cups, this tank is inspired by women who aren't afraid to sweat it out. Created with UPF 50+ technology, the Ambu Tank - Sonoma ensures flattering coverage and sun safety for every outdoor activity. I wish it had more support similar to a sport bra. Its kind of how it is shaped. It fits well though, it just the ladies are falling to the side. good fit, only worn once but comfortable. I like the older style of this tankini. This one has zero support. Still love company but bummed about this top. Q: What is the length of the top.Shoulder to hem. I plan on ordering a Small WOMEN'S AMBU TANK - SONOMA. Also, to confirm, the active wear is good to use inside the pool/for swimming? Thank you. Q: how does this compare to the sol twist bra control fit in terms of support? A: Thank you for contacting TYR Sport! Our Women’s Ambu Tank-Sonoma has a V-neck cut, racerback with support straps and removable contour cups. The Women's Solid Twisted Bra Tankini is equipped with built-in contour cups to maximize your shape, the TSTB7A is also created using our most advanced fabric - Durafast Elite. Our Solid Twist Bra will have slightly more support, and coverage. Q: Where can one find a size chart for your swim suits? A: Thank you for contacting TYR Sport! We are always eager to answer any questions you have about our products. Our size chart can be found directly under the product you are searching.